PLUG & PLAY series proposes compact portable solutions, which in the best way combines power and high sound quality. Totally independent powered systems consists of a small subwoofer and miniature satellites, still delivering considerable sound pressure. The PLUG & PLAY solutions are ideal for small- and medium-sized bars, restaurants, karaoke-bars, corporate events and parties. One of the most important features of PLUG & PLAY is the convenience and ease of use. These sets are ready-to-use “right-out-of-the box” plug and play. User just connects satellites to active subwoofer with build-in three-channel amplifier. Additionally, extra subwoofers may be used for further expansion of the system. The loudspeakers are made of high-quality birch plywood and covered with flow-wear textured paint. The bandpass subwoofers are optionally equipped with castor wheels. The satellites have two-angle pole mount adapters, and subwoofers have M20 sockets for distance pole-mounted satellites. 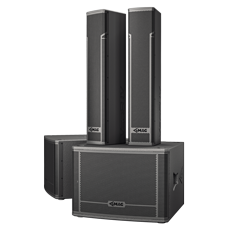 All models are available in powered versions, providing bi-amp Powersoft amplification.